The BlackBerry World 2012 keynote session is now over. If you followed our live blog you already know that we were pretty excited by the innovation that RIM unveiled -- BlackBerry 10. The user interface was stunning. The on-screen keyboard rocked, with its unique way of presenting word suggestions and using swipe gestures. And that camera app, which functions like a little frame-by-frame time machine ... fantastic stuff. I hope RIM has patented all of these innovations. So why is RIM stock down? It's down about 3% while the broader NASDAQ is up slightly today. On the live blog I said I'd be shocked if RIM didn't trade up today. I seem to have a knack for being wrong about how the market will react to news. The stock market is a funny beast. People scream for innovation out of RIM. Yet when RIM delivers smashingly innovative stuff, they yawn and find something else to complain about. We've got to keep in mind that RIM hasn't actually delivered any of this in a commercial device yet, and the timing is uncertain. So the market has a right to remain skeptical. But at the same time, the audience inside of the keynote session at the Orlando World Center Marriott was pumped. Applauses interrupted Thorstein's portion of the keynote more than I can ever recall in a RIM CEO presentation (or really any RIM presentation). So there's a disconnect between the audience (who are developers and enthusiasts), and the market. And disconnects like this don't live forever. They can't. Either the company fails to execute on getting this great stuff out the door, and the audience is let down, or RIM actually hits its mark. I actually feel proud to be a RIM shareholder again. I was actually convinced that I might enjoy switching to a touch screen keyboard. I'm loving BlackBerry 10. But the market obviously remains highly skeptical. So we wait. The launch of BlackBerry 10 is "make it or break it" for RIM. I think they'll make it. 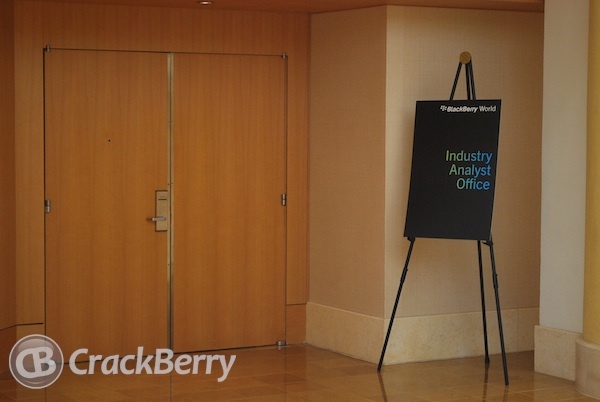 Stay tuned for a follow up where I'll post my thoughts on RIM's messaging and overall keynote session.